As a member of the the Intuitive Eating Community Forum since July 2015, I have read a range of posts from people’s lowest, most dire times to those of success that then inspired others. Now that I’m the moderator, I am in charge of approving new forum members and reading all of their posts. Naturally, newcomers have many questions, but the most common question I hear is around weight loss while practicing IE.1 This is a valid question, but weight loss is far from the focus of intuitive eating. When someone poses question “Will I lose weight with intuitive eating?”, I give the answer “It depends”. I know this is wishy-washy and not the “Yes, of course!” answer the the person hopes for, but it’s true. If you are under your natural weight like I was, then gaining weight would make sense. If you are at your natural weight, then you’ll likely stay put. If you are above your natural weight, then you may lose some of the excess. The Intuitive Eating authors stress the importance of putting weight loss on the back burner. I get it. If I focused on my weight, then I’d be sabotaging the whole process. I would still be governed by diet rules, obsessed with dieting numbers, and frantically pursing the “ideal” body instead of rediscovering my intuitive eater. I had to surrender to the process even though it made me feel out of control. Knowing my weight gave me comfort all the while driving me crazy. I had to learn to let it go, but it was far from simple. My fight with the scale was one of my major obstacles with IE, but my ability to push through it not only gave me peace of mind, it also built my character. You may have lost weight with dieting, so I understand the appeal, but have efforts to permanently lose weight been successful in the past? When you weighed less, did your life improve dramatically in some way? And to set the record straight, the IE authors never say that they are against weight loss. They are against intentional weight loss in pursuit of some arbitrary beauty standard that society has inflicted upon us. That doesn’t mean you should feel guilty about wanting to lose weight; all of your thoughts and feelings are valid. It’s hard to not have a desire to lose weight when you dislike your size or the way you look, but we all need to be aware of where this desire comes from. Some people gain weight with IE, some lose, and some stay the same but are just more at peace. And isn’t that the point of IE? To make peace with food and your body? As difficult as it is, I encourage you to consider the authors’ suggestion of putting weight loss on the back burner as best you can.5 If the idea of weight loss remains in your life, you essentially are keeping one toe in the dieting world and that will prevent you from being truly an intuitive eater. When you do put weight loss on the back burner, you’ll find that trusting and accepting your body will be so much easier. 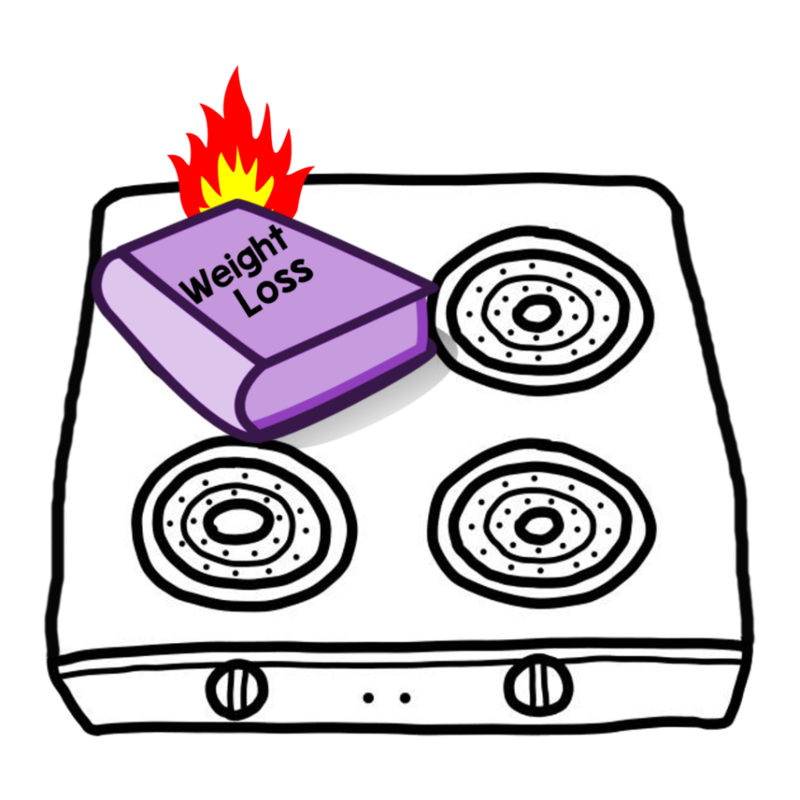 Where are you with putting weight loss on the back burner? Please share in the comment section below. 1This is especially true in January after people have made their New Year’s resolution to find a new miracle diet. 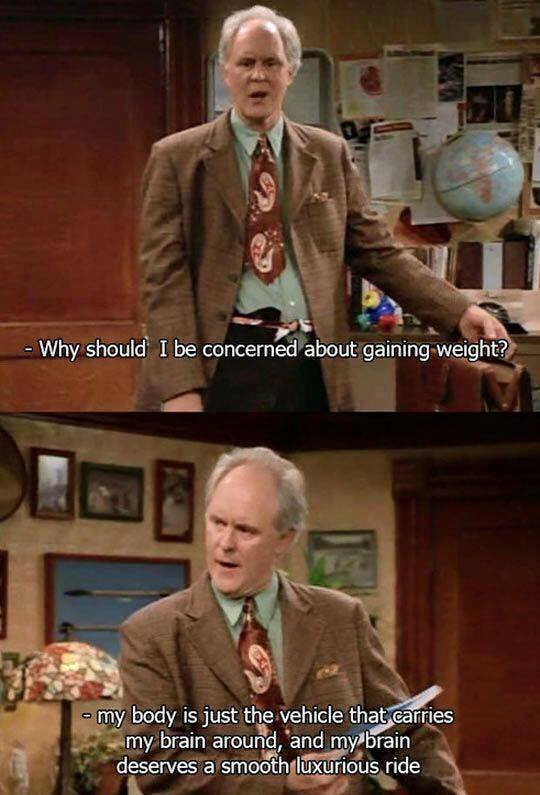 2These are the same questions I ask myself when my mind toys with the idea of losing weight. 3Most of the time. I am human. 4I just love me some John Lithgow. He kills it in 3rd Rock From the Sun! This is probably the most important lesson I need to learn. Having achieved and maintained artificially low weight after 50 years of yo-yo dieting, I ended up cold, permanently hungry, depressed and fearful of regaining weight. I didn’t see the expected dramatic improvement in my life, rather the opposite. IE came along at just the right time to give me a real chance of turning my life around. I will follow the rest of your blog with interest, thanks Deborah. I also found that IE appeared in my life just when I needed it to and it has made such a big difference in how I approach food and other aspects of my life. I’ve just started my IE journey (on Monday). Putting weight loss on the back burner is BY FAR the hardest thing about IE for me. I already feel 1000% better letting go of the control that food has had over me for the past 18 years of dieting. The trouble that I’m having is that I know I need to lose weight because my joints/body do not feel good at this weight. I want to be able to move more freely and without pain and know that has come from weight loss before. And to be honest, there is also some vanity behind the weight loss, but the majority is to be able to enjoy my life walking around in my own body. Thank you for sharing and being so honest about your journey! You have only been doing IE for 4 days, so you are just an IE infant. Putting weight loss on the back burner is hard and it’s not something that is easy to come to terms with. If you are not ready to work on that part of IE yet, that’s fine. Take it at your own pace and in a way that makes sense for you. Maybe work on your hunger or a small aspect of diet mentality (e.g., donating dieting books, unfollowing diet focused people on social media, etc.). When it’s time to tackle putting weight loss on the back burner, you’ll know.